Change up your side dish routine and serve a healthy, protein-filled quinoa salad. This Quinoa Salad recipe with Corn, Tomato and Cotija Cheese is a tasty side to any meat off the grill. Quinoa Salad. What started as a quest to get my family to add whole grains to their diets has quickly become a family favorite. When I served a quinoa salad for the first time, it received a less than enthusiastic response… until they tried it. Now we have several salads that are go-to recipes. 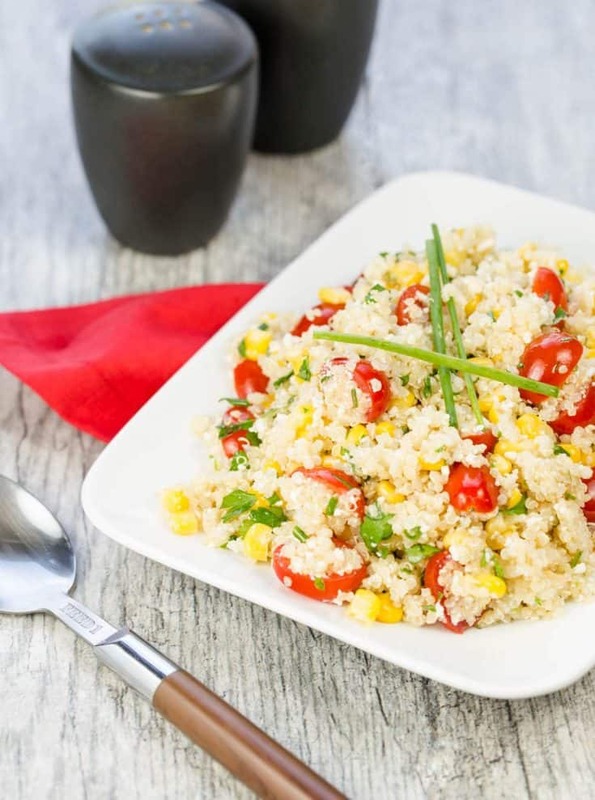 But this Quinoa Salad recipe with Corn, Tomato and Cotija Cheese is one of my favorites. I love the fresh, simple flavors that let the herbs shine through. I mean who wouldn’t love some fluffy quinoa tossed with corn, fresh tomatoes, herbs and a sprinkle of Cotija cheese? 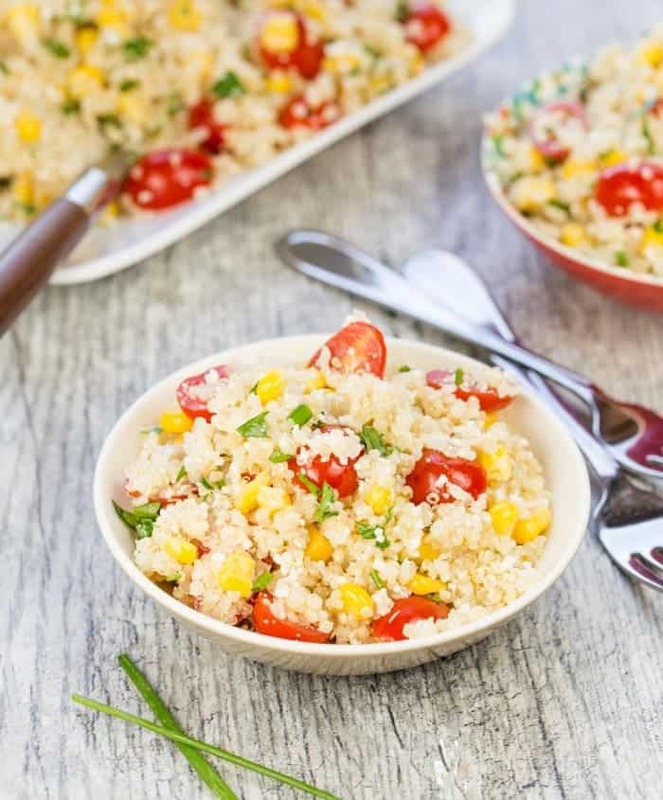 This Quinoa Salad recipe with Corn, Tomatoes and Cotija Cheese is a great side for any meat from the grill or fabulous with a French Dip. One of the best things about this salad? You really can’t screw it up. Promise. The hardest part is making the quinoa (and that’s pretty easy). Just chop, mix and serve. Easy peasy. And if you are one of those people who doesn’t like cilantro, just double the parsley and you’ll still have a fabulous salad. Another bonus? This recipe makes a lot of quinoa salad and that’s a good thing because the leftovers are fabulous for lunch. That’s coming from a girl who doesn’t eat leftovers. Enough said, right? Make it and tag us on Facebook. We love seeing your creations! Tip: If you are grilling corn, save the kernels from a couple of ears to add to this salad in place of the frozen. You won’t regret it. In a medium saucepan combine water and quinoa and bring to a boil. Cover, reduce heat and simmer for 14 minutes or until liquid is absorbed. Remove from heat. Let stand 10 minutes. Whisk together white wine vinegar, olive oil, salt and garlic. Pour over quinoa. stirring gently. Add tomatoes, corn,cilantro and parsley. Squeeze juice from half of lime over top and combine. Before serving mix in cotija cheese and squeeze with juice from other half of lime. Serve cold or room temperature.